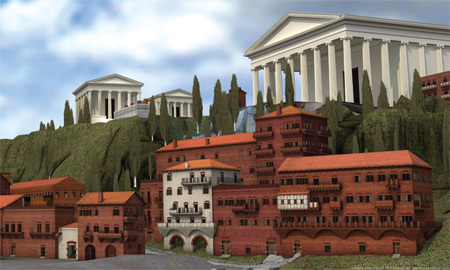 Video: A Virtual Tour through Ancient Rome in 320 C.E. In this virtual tour, we discover ancient Rome, guided by renowned “virtual archaeologist” and overseer of the Rome Reborn project Dr. Bernard Frischer, professor emeritus at the University of Virginia. He picks 320 C.E. as the year of the tour, “the peak of Rome’s development, certainly in terms of public architecture, for the simple reason that the Emperor at this time was Constantine the Great.” Shortly after the era represented here, Constantine moved the capital from Rome to Constantinople. A joint project of Khan Academy and Rome Reborn. Reblogged this on Malkit Bharj. This entry was posted on April 18, 2015 by Vox Populi in Opinion Leaders and tagged Opinion Leaders, Social Justice, Video, War and Peace.